On July 1, 2018 Mexican voters went to the polls to decide the fate of their entire federal government: one president, 500 members of congress, and 128 senators. 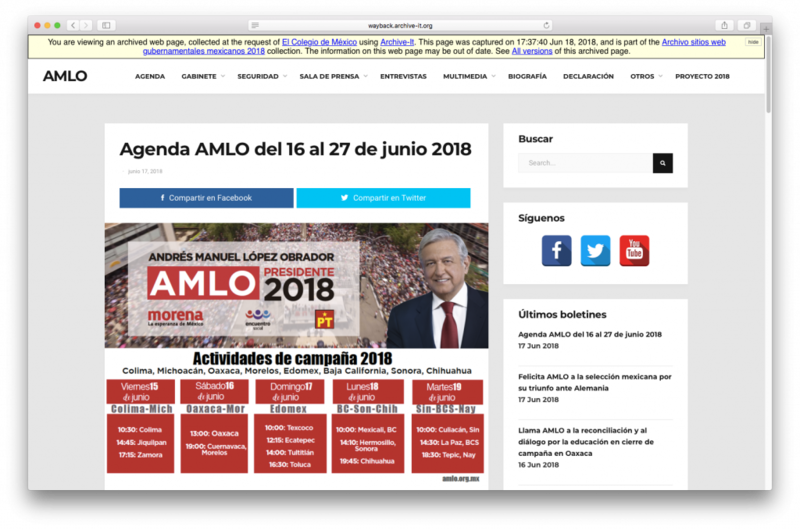 The results bring big changes, starting with the December inauguration of Andrés Manuel López Obrador, known better as AMLO, as president. It’s the first time in over 80 years that Mexico will not be majority-governed by one of the two parties that has dominated national and local politics since the 1930s. Because of the importance of this general election and the conversations around internet and governmental transparency in Mexico in the last few years, we decided at the Biblioteca Daniel Cosío Villegas at the Colegio de México to reach out to Internet Archive and Archive-It to pilot a web archiving project in order to capture crucial federal information ahead of the elections and administration change. You can now view the collection via Archive-It here: https://archive-it.org/collections/10298. Archive-It was interested in the proposal and we quickly signed a Memorandum of Understanding, giving us a defined allowance and time frame for the archiving of the websites. We were then able to attend training and got our logins and access to the platform. We also decided in this pre-planning phase on how we were going to divide the labor of selection, cataloging and technical stewardship. Natalie Baur, Preservation Librarian, had a bit of experience with web archiving in past positions, but none of her colleagues at the Colegio had done this kind of work previously. Natalie took the lead on overall project management and working with the Archive-It service. The library then formed an advisory committee that comprised of several professors and the Archivist of Mexico from the Archivo General de la Nación. In order to engage our own academic community, we also made a call to the Colmex community to send content proposals that they considered of interest for the development of their research. Mariana Córdoba, a subject librarian at the Colegio, took the lead on training and leading subject librarians in the selection of websites, including Lourdes Guerrero, Máximo Domínguez, Tomás Bocanegra, Camelia Romero, Eduardo Ruvalcaba, Claudia Escobar, and Víctor Cid. In order to aid this work, Mariana and Natalie put together a written tutorial and provided the metadata fields necessary for creating the seeds, and head of cataloging Guadalupe de Vega and cataloger Carmen Yasmina López took charge of organizing and authoring metadata for the seeds. What drove this project from the beginning were two things: scope and the fact that it is a pilot project. We had a limited data allowance available on the Colegio’s Archive-It account. This was also new work for our institution and for the country at large. We also had very limited time available in which to train and familiarize ourselves with web archiving and the tools before the July deadline. We had to take the time to create the training and bibliographies and workshops with the subject librarians for the selection process. Because they had to do something completely new and on top of the numerous responsibilities they already have among regular duties and other special projects. That being said, we decided to focus on three collecting areas: the thirty or so main federal departments and cabinets; the six presidential candidate websites; and the website for the Instituto Nacional de Acceso a la Información. Our review panel also added additional materials as was feasible with space and scope considerations. Because of the nature of this project as a pilot and its limited size and scope, it has been challenging to communicate these restraints to project stakeholders, especially to the advisory committee and other colleagues wanting to contribute selection ideas to the project. Taking this archival, contextual approach helped Natalie as project manager to communicate the reason that this project, in its nature, will be “incomplete.” That is, we can’t archive everything. But because the scope and contents of the collection were articulated, it did allow for us to present a coherent final project and product. The hope in this is that other institutions will also take steps to initiate their own web archiving projects to “fill in the gaps.” One other consideration that we are thinking about is that we decided to go with a service that traditionally charges service fees for persistent storage. Because of our time constraints, we needed something that we knew would work right out of the box and that also had support services attached to it. However, for many institutions in Mexico, this kind of arrangement is just not possible from a funding standpoint. 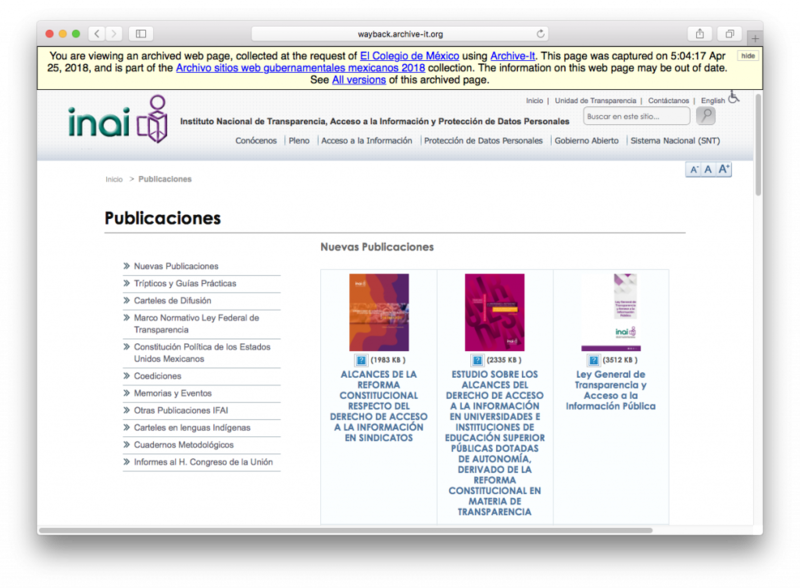 We hope that through this project we will bring other Mexican institutions and institutions from Latin America into these web archiving conversations and communities so that we may enrich our discussions and the social and technical possibilities of our tools.